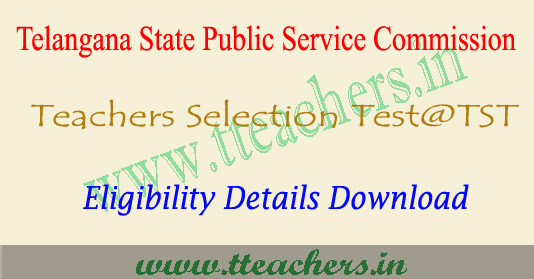 TST 2017 Eligibility Criteria details given by TSPSC : Telangana State Public Service Commission (TSPSC) conducts Teachers Selections Test (SA & SGT Posts) time to time. Candidates who want to be a part of this well known organization may check the TSPSC TS Eligibility Details 2017 and age limit for OC/BC/SC/ST for the session of 2017-2018. Candidates who are searching for the TSPSC TST Eligibility Criteria like Qualification Details, Age Limitation required for attending the exam etc. must go through this page. 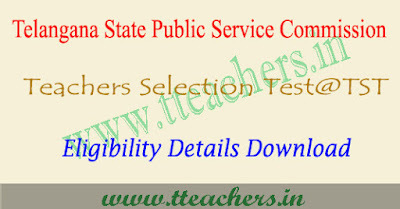 From this year Telangana State Public Service Commission (TSPSC) conducts Teachers Selection Test Examination for SA, SGT an PET posts. To know TSPSC TST Eligibility 2017 read the information given below after officially released. Applicants interested to be recruited for TSPSC TST Jobs, may ensure that they fulfill the eligibility criteria as specified by the organization and fill the application form before the deadline.